For lions prides, the movement of territories is like a game of chess. 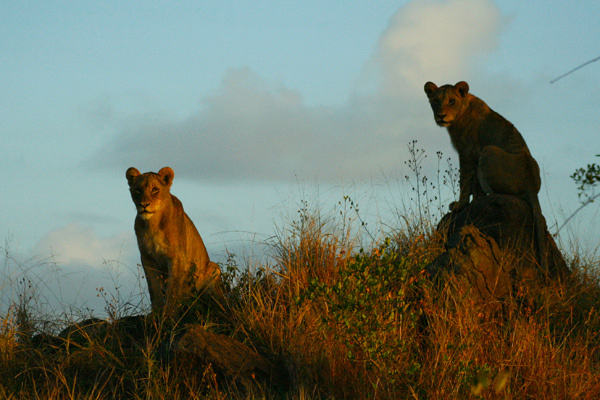 Depending on different variables such as density, strength and confidence, the size of each pride’s territory is unique and constantly changing. When a pride is moving around the northern regions of their territory, for example, a portion of the southern part may be usurped by another pride. This is until such time as the prides move south and reclaims their area through vocalising and, if need be, physical force. Physical force is precisely what happened in the above encounter. 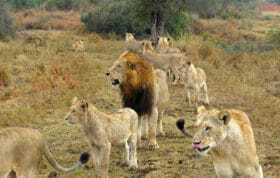 On a loose boundary between the two pride’s territories, the Tsalala lionesses came across the young Sparta lions. Playing on the lack of confidence amongst the younger lions as well as the element of surprise the mature Tsalala females made sure that they frightened the other lions in to retreat. Not only did they reclaim a small southern portion of the territory, but they also stole the remainder of the carcass. 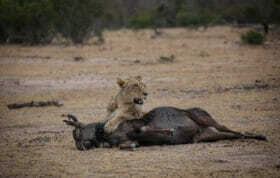 Although outnumbered, the Tsalala lionesses had both the experience and size to confidently take on the young lions. For the scattered lions of the Sparta pride, they regrouped later that day and made swift southward movements back towards the heart of their territory in central Londolozi. It was a valuable lesson learnt for these young Sparta lions as they will no doubt increase their awareness and guard as a result. For the Tsalala lionesses, it merely exemplifies why this pride continues to endure through tough times. They are tenacious, forthright and clear as to what belongs to them and how exactly to maintain it. Very nice indeed , interesting interaction between prides . But something is not match perfect…. do you say young Sparta lionesses ; as I see there are four lionesses from Sparta pride . I read in your early blogs that one of the young Sparta lionesses was killed by Majingilane . So it must be three young Sparta lionesses . Who’s the fourth ? An older one or maybe the young lioness survived ?!! Maybe you can help me to understand . It would’ve been interesting if Solo was there. Between his adopted pride (Sparta) and his mother and aunts (The Tsalalas)…who knows how the outcome of this conflict would have been?!! Fascinating and great to see the Tsalala girls being so bold and determined. They are fantastic lionesses. Thanks for sharing! Very interesting. Are these the young lionesses or a combination of the old lioness and the two lionesses whose cubs were killed and the young ones? The pride still seems split up? I have a question. The roaring by the females… is that to be understood as some sort of victory chant? Mele – In the Sparta Pride, there are 3 young females, three adult females, two young males and the Tsalala young male at the head of the pride. Only one of the adult females( the older one of the three) was with these three young females when the interaction took place with the two Tsalala lionesses. Kk – The lionesses involved are the three young lionesses from the Sparta pride and one of the older lionesses. The two lionesses from the Sparta 2 were not present. The pride does split up and come back together over a course of time. Morty – It is not a victory chant but rather a vocal display to signal their dominance at having chased the other lions off. It is also used as a way to claim territory as well as to call other lion/lionesses. Rich now is very clear and is very nice you help us to understand the real situation in Sparta pride . What is the truth Rich ? Thank you Rich for the insight…One more question…Has the Tsalala young male (Solo) been observed scent marking, claiming territory, roaring his dominance? Or is he still laying low in fear of the Mijingis? 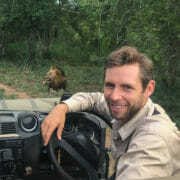 Rich it seems Solo is the most ”wanted” character from Londolozi …a lot of questions indeed… Maybe you could provide new fresh videos with Solo and his mates , certainly you will make happy a lot of Londolozi’s funs !! Londolozi did a ‘piece’ on Solo/Tsalala male on March 7th but I think he is becoming very famous with alot of people cheering for him. He is a survivor who has somehow made it in the hard world of lions. People always love the underdog who somehow makes it and turns into a great warrior! Would love to see some recent photo’s of him. Apparently, he has grown quite impressive.